This painting was done at the request of Dorrance Kelly, D.D.S. of Danbury, Connecticut, whose grandfather was Talmadge Mister of Deal Island, Maryland. 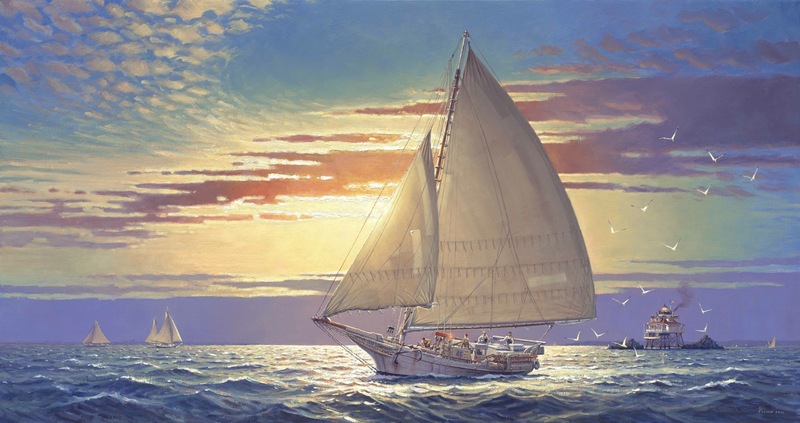 Dr. Kelly wanted a painting showing his grandfather aboard his favorite skipjack. This scene takes place in the early 1900s off Thomas Point in the Chesapeake Bay. We see Captain Mister aboard his skipjack Amy Mister sailing back across the bay to his homeport of Deal Island on the eastern shore of Maryland. The lighthouse is the famed Thomas Point lighthouse that is located on the Chesapeake at the mouth of the South River near Annapolis. It is early winter and the oyster season has begun as evidenced by the steel oyster dredges resting on deck of the vessel. These locally built, wooden sailing boats were designed for harvesting oysters from the shallow beds in the bay. At the turn of the century there were about 1,500 working in the region but today their numbers have dwindled to about one dozen. The Amy was built in 1914 at Oriole, Maryland and measured 58 feet in length. The skipjack is the last fishing vessel to work under sail in North America. Captain Mister lived on the island with his family and in addition to Amy Mister, named for his daughter, he also owned another skipjack, Fulton T. Mister and a bugeye ketch, Catherine – both can be seen in the left background of the painting. Thomas Point lighthouse was first built on shore near this location in 1825 and due to erosion of the land and the lack of visibility of the light in foul weather; the structure was moved offshore, near the shipping channel in 1875. Since the pilings are literally “screwed” into the sea’s bottom, they are called “screw pile lighthouses” and this is the last of many similar structures on the Chesapeake that still serves as an aid to navigation warning mariners off the shoal. Oil on Linen 18” x 34”. From the Collection of Dr. Dorrance T. Kelly, Danbury, Connecticut. Dr. Kelly wished to have prints made from his painting to share with family members. I arranged to have five paper and five canvas giclees made for this purpose. J. Russell Jinishian who is recognized as the nation’s leading authority on contemporary marine art arranged this commission. His gallery in Fairfield, CT specializes in fine Contemporary and Antique Marine and Sporting Art from Europe and America. The archival photograph of Amy Mister is courtesy of the Chesapeake Bay Maritime Museum, St. Michaels, Maryland and it and others were critical to the creation of this painting.